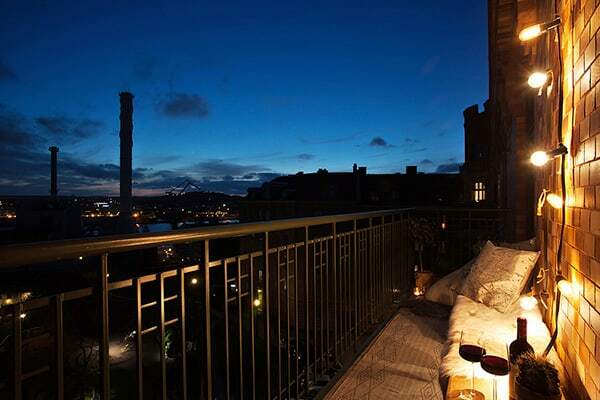 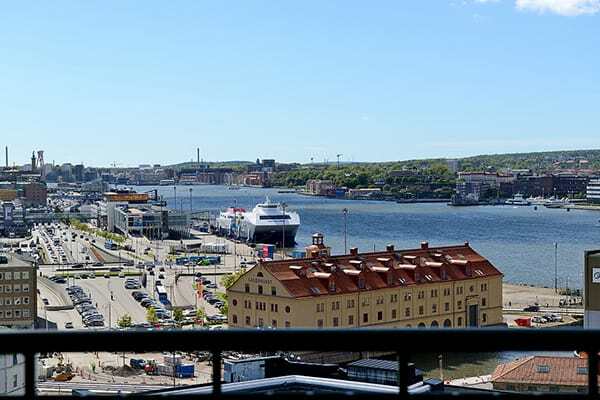 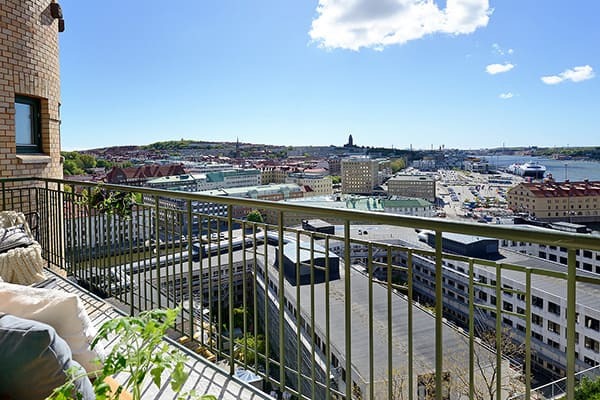 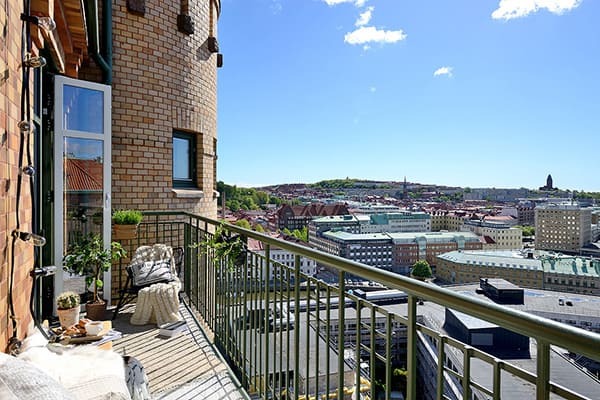 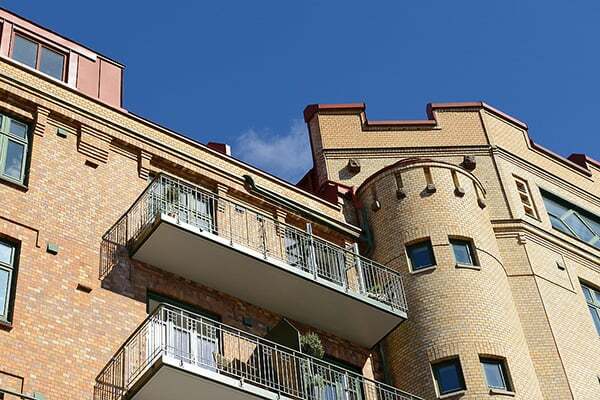 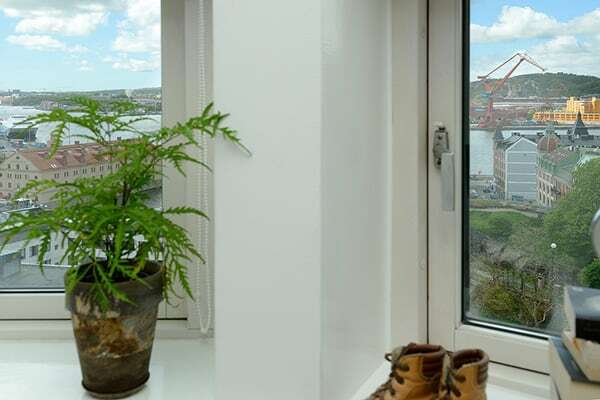 This completely renovated turn of the century apartment is situated on the top floor boasting breathtaking views over the city and harbor, located in Gothenburg, Sweden. 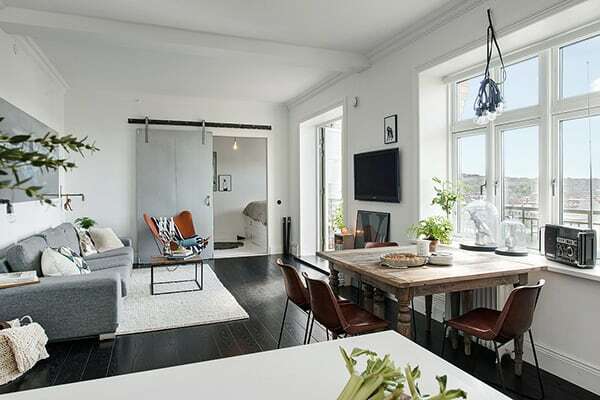 The small 721 square foot (67 square meters) home is comprised of a living room, kitchen, bedroom, bathroom and small west facing balcony off the living room. 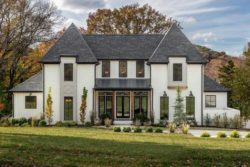 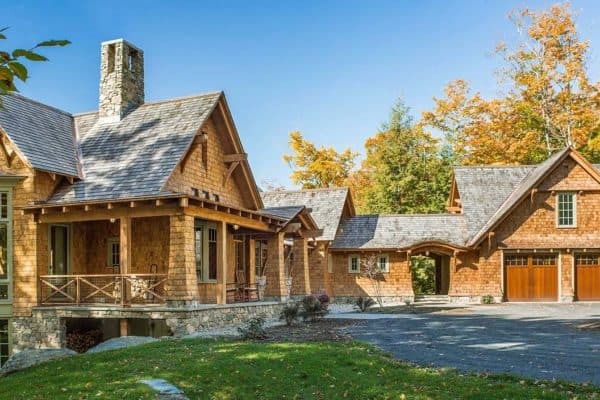 Natural light illuminates this stylish home that comes complete with exclusive and well selected details and materials. 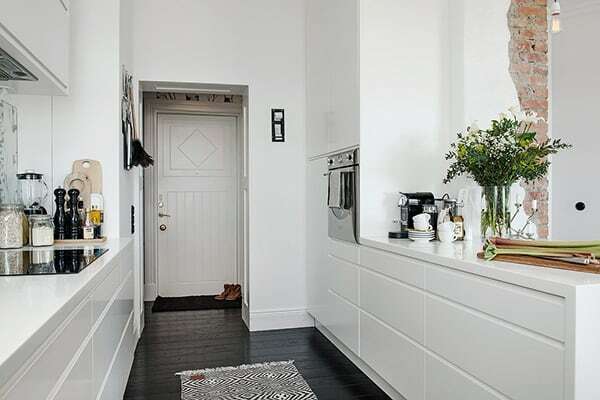 Everything has been very well thought out and very tastefully decorated. 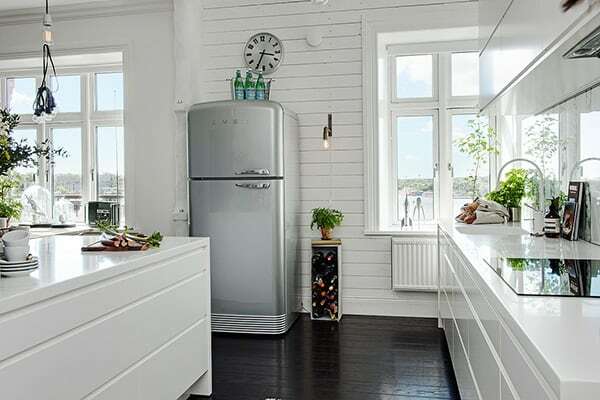 During the renovation process, the goal was to integrate typical turn of the century character with modern materials. 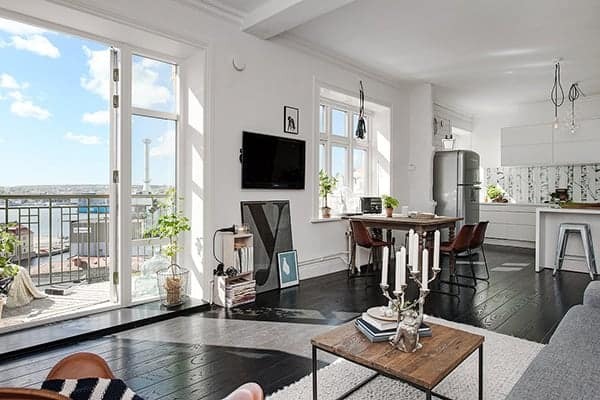 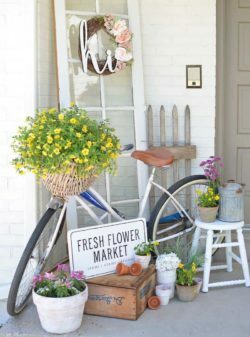 The overall aesthetic turned out flawless, with a harmonious connection between the early 1900s and industrial elements. 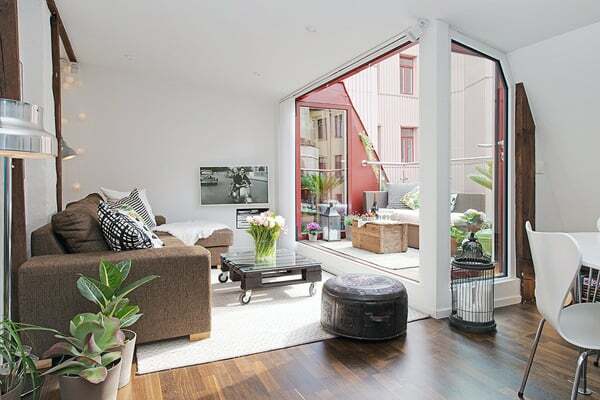 The layout was changed around to create a nice transparency, maximizing surfaces and increasing luminosity. 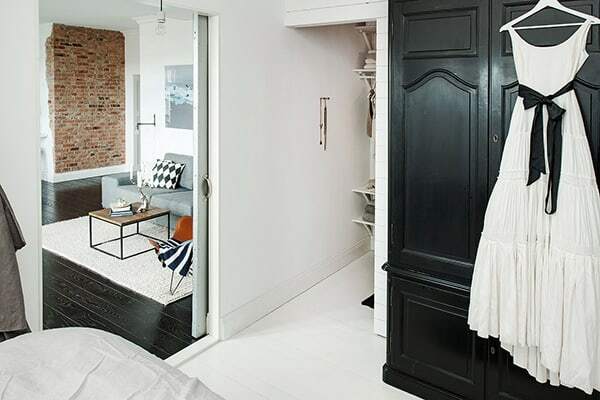 A wall between the kitchen and living area was torn down to create openness and the bedroom was decreased in size to allow the social area to gain extra space. 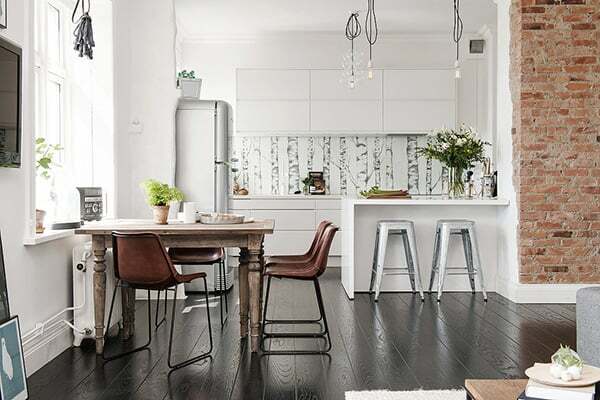 The flooring throughout the main living spaces is comprised of black plank floorboards, with a nice visual contrast of white planks in the bedroom and bathroom. 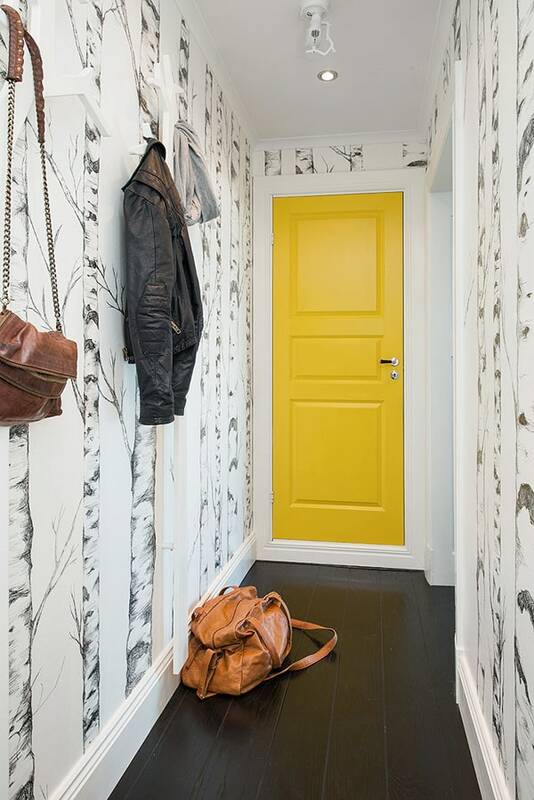 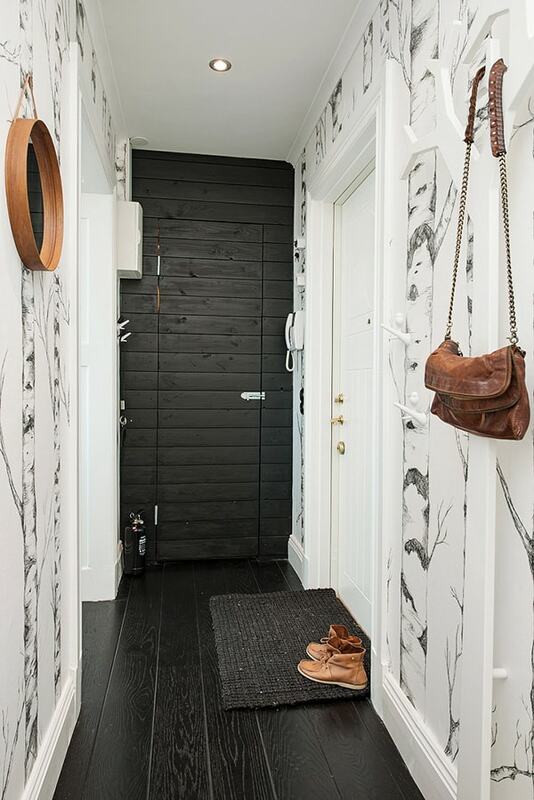 Upon entrance into the welcoming home, you are greeted with soothing wallpaper in the hallway. 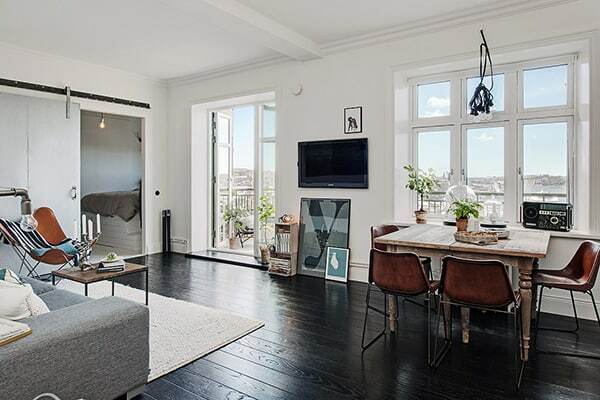 The open floor plan between the kitchen and living room offers a pleasant social atmosphere, whether you are lounging on the sofa sitting around the dinner table, you can enjoy the city’s very best views. 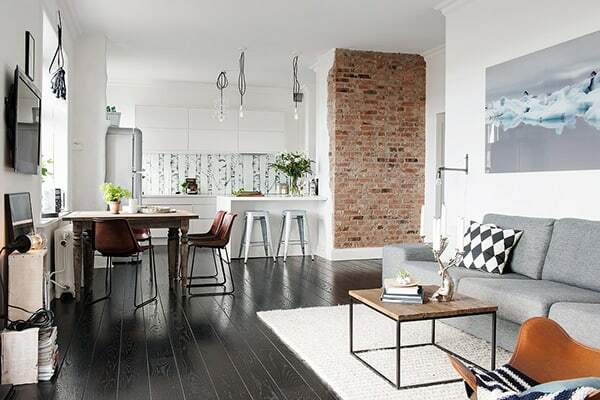 The walls were painted a crisp white, with a feature wall between the kitchen and the living room showcasing exposed brick. 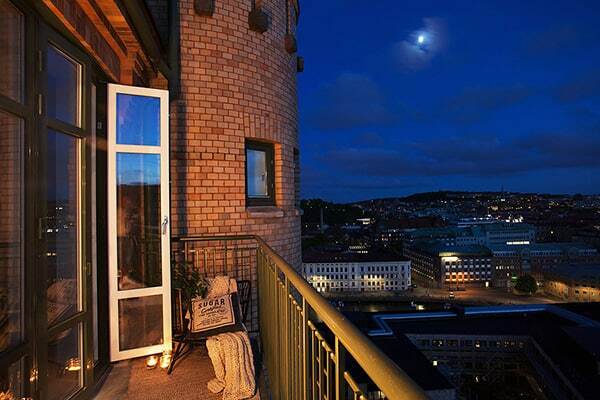 Glass doors opens out to the balcony, where you can sit and enjoy a cup of tea and enjoy the stunning views. 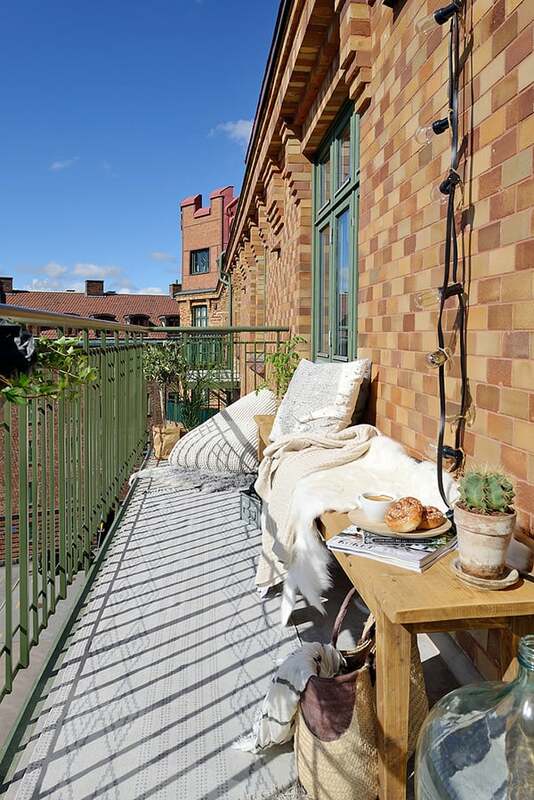 This is a great spot to enjoy all year round, nestling in a cozy blanket during the brisk winter months. 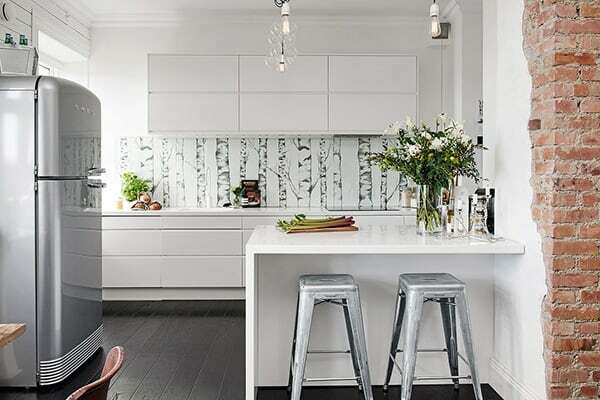 The stylish white kitchen with austere design and exclusive details, speaks for itself. 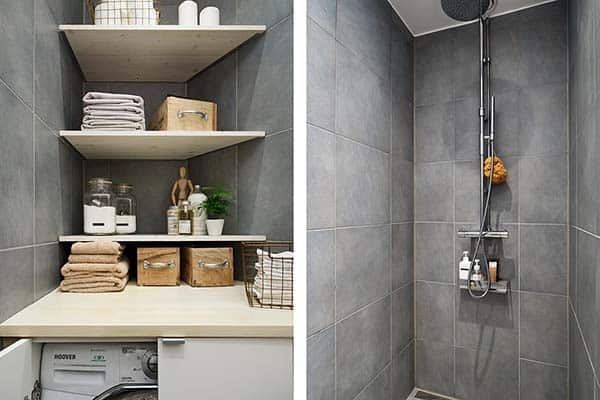 There is plenty of cabinet storage with a beautiful backsplash with glass covered wallpaper that repeats from the hallway. 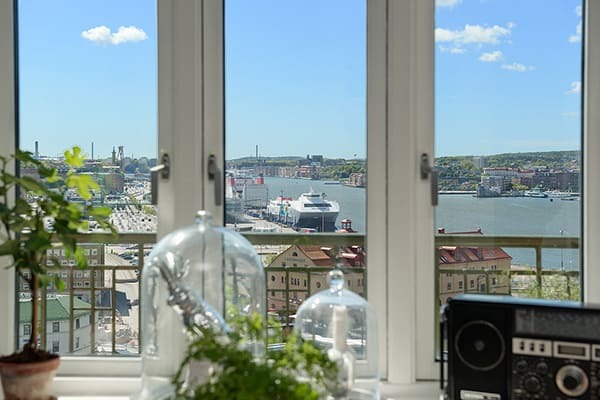 The kitchen cabinetry runs all the way to the large window, which makes it a joy for cooking with views over the harbor of Gothenburg. 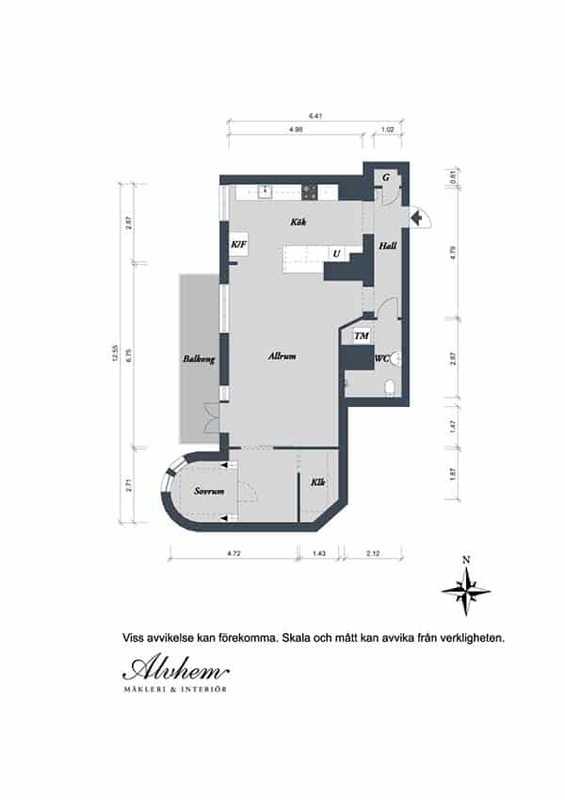 The kitchen and living area have been separated by an island where guests can sit and keep the cook company. 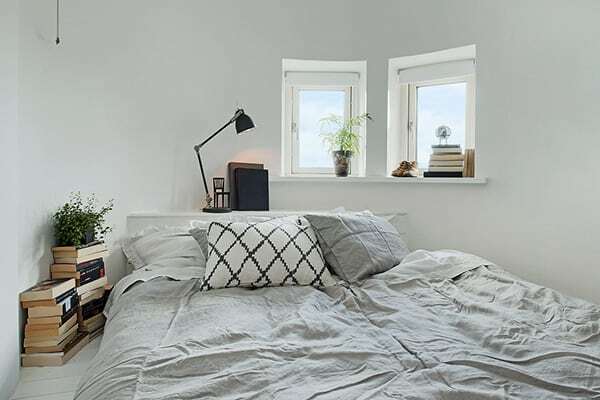 The bedroom is a charming tower room separated by a large industrial sliding door. 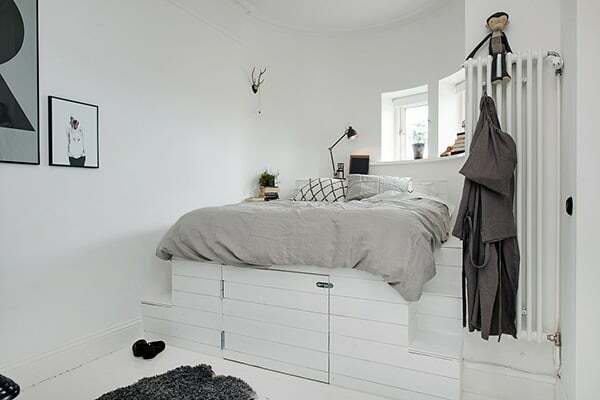 To maximize the small space, a clever built-in bed was designed with hidden storage accessed beneath. 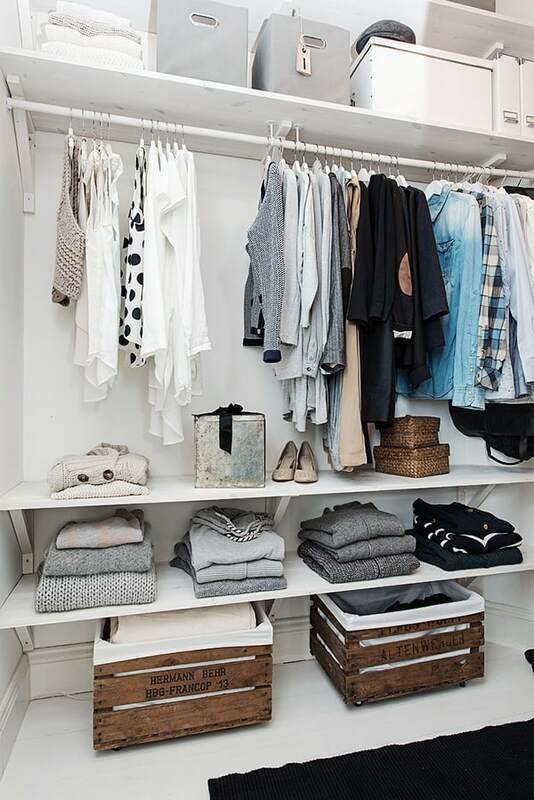 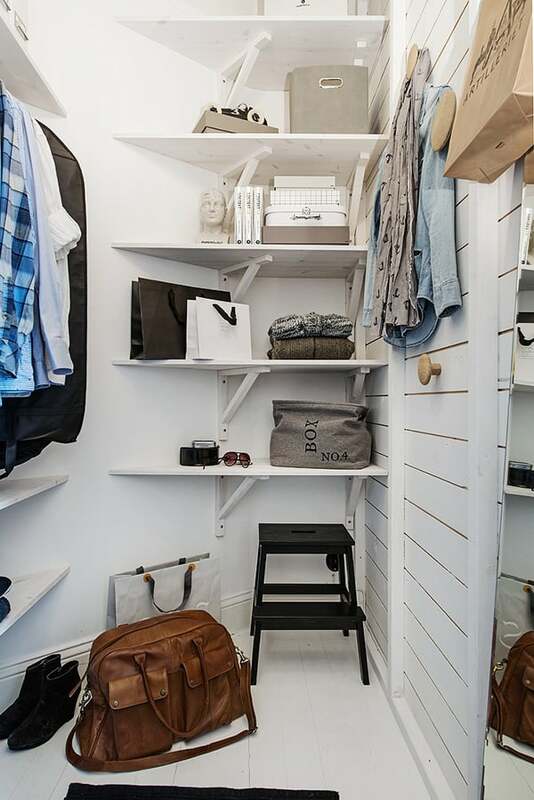 A walk-in closet also has plenty of space for clothing. 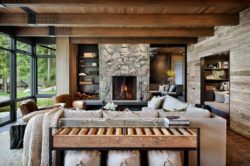 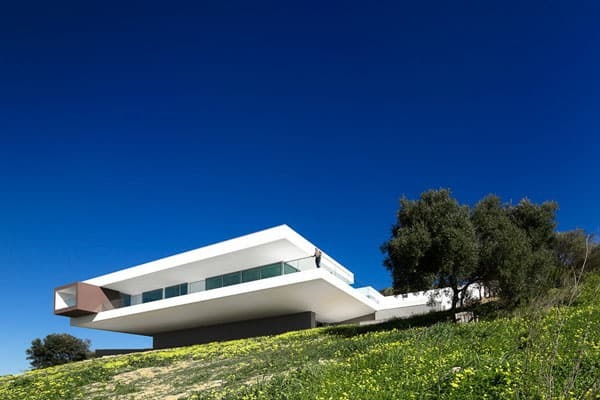 Windows were incorporated high on the wall to bring in light and views. 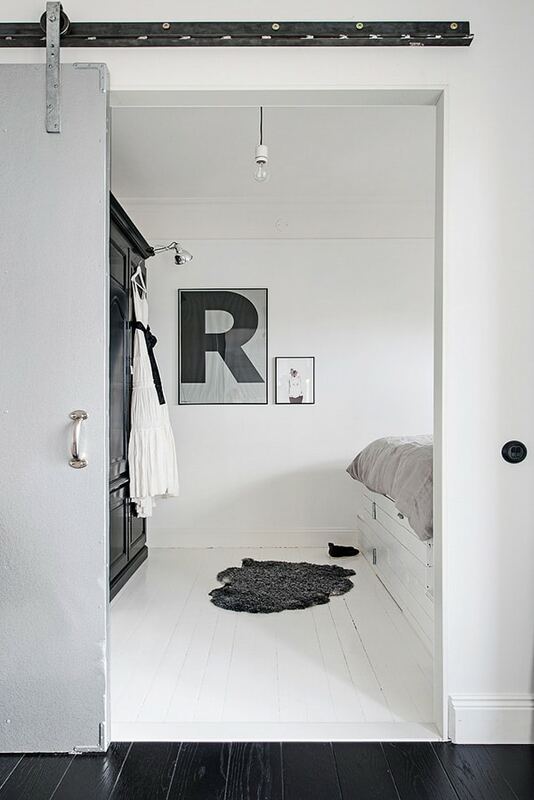 The original flooring was preserved in the bedroom and closet areas and refreshed with a coat of white paint. 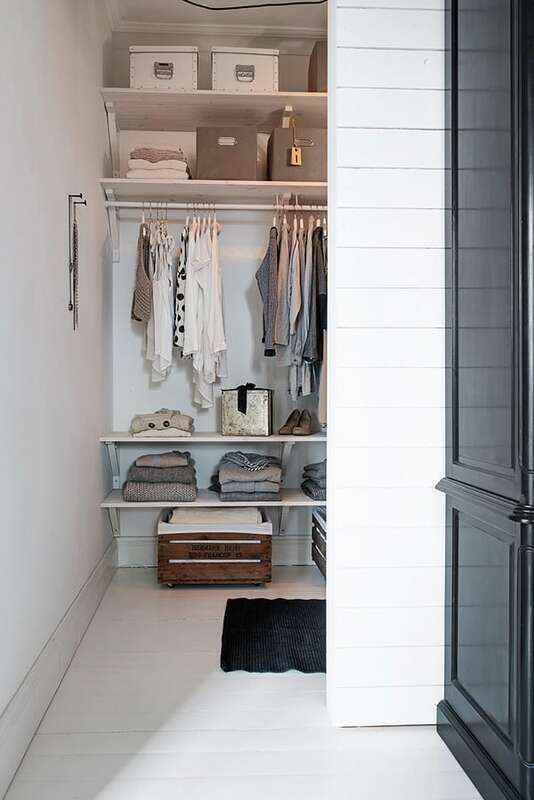 The bathroom was expanded to allow for a combined washing machine and dryer. 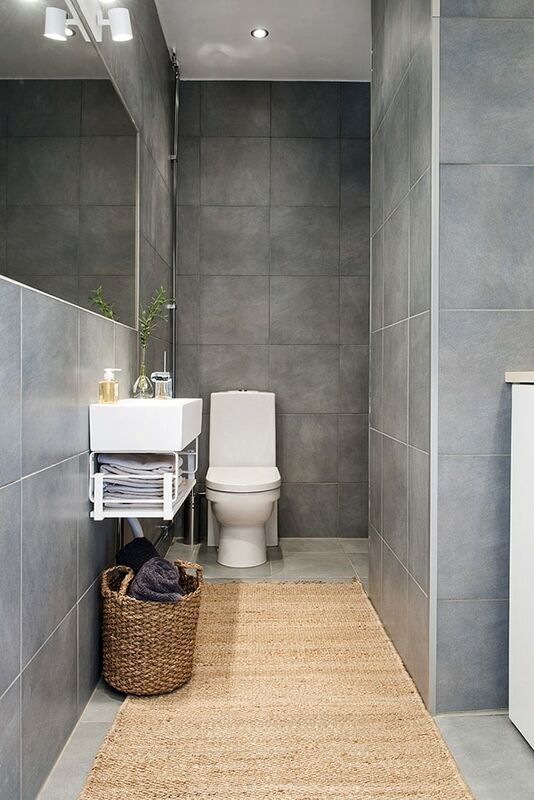 Walls and floors are adorned with exclusive gray tiles. 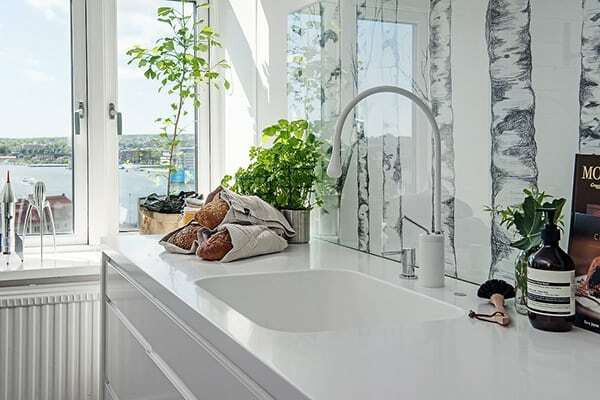 The shower is recessed in a niche and underfloor heating was incorporated for maximum comfort.